Featuring an impressively stylized design, this 1st Century Roman Cavalry Embossed Helmet is an incredibly decorative helm that would have likely been favored by members of the Roman cavalry, especially by officers enlisted in their ranks. This helmet is patterned after the classic Roman helmet from the earlier ages, although this one is far more elaborate in appearance. The crown of the helmet is rounded and features elegant wavy designs across its surface. The front of the helmet features a smooth section that is embossed with a portrait, likely of the emperor at the time. The cheek flaps that hang down from the sides are also embossed with an enthroned figure. Just behind the cheek flaps are molded ear designs that sit right over where the actual wearers ear would normally be. The back of the helmet features a flap that helps offer a bit more protection to the wearers neck. This impressive helmet is made from quality metals and features a finish similar in color to polished brass. 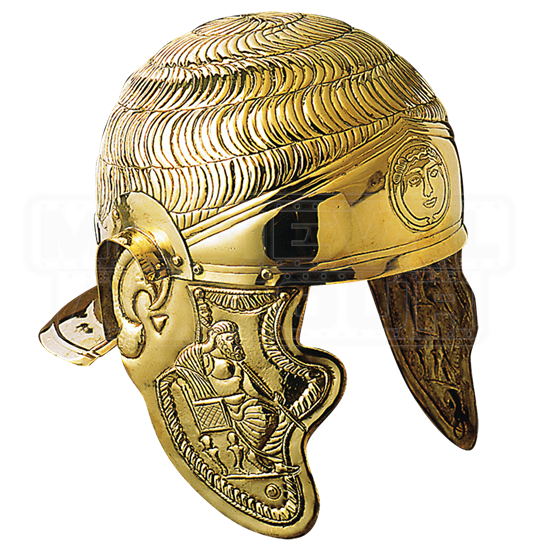 You can, of course, wear this 1st Century Roman Cavalry Embossed Helmet as a part of your reenactment attire, or you can display this beauty as a part of your collection so that others might also admire its remarkable appearance and craftsmanship.